Mariko Yamamoto（山本真理子）Sensei (26 years old, 5 Dan) won 1st place in All Japan Women‘s Kendo Championship in 2012 and 2013; 3rd place in 2014 and 2015. 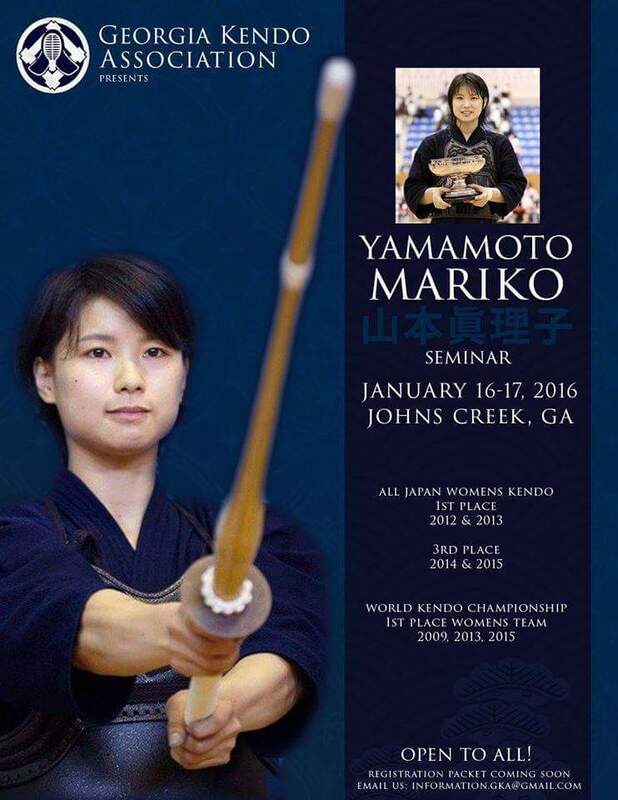 She has also been a member of the Japanese national kendo team to win 1st place in WKC in 2009, 2013 and 2015. Her father Masahiko Yamamoto (山本雅彦) is a Hachi Dan Kyoshi (specializing in Jodan 上段) and one of the coaches at Osaka Police Department, where Mariko Sensei now works. The seminar fee will be $30 for the two days. This past weekend the SWKIF held the Fall Seminar and Shinsa in Little Rock, AR, hosted by Kajitani Sensei and the Arkansas Kendo Club. Guest sensei includes Onitsuka Sensei, Harada Sensei and Tamura Sensei. The Dan level (incl. 1-kyu) Shinpan Panel Sensei are: Yuji Onitsuka, Brandon Harada, Mark Uchida, Michio Kajitani, Katsuyuki Ken Tamura, Russell Ichimura Sensei. The Kyu level (2-kyu and below) Shinpan Panel Sensei are: David Cooper, Steve Sasaki, Makiko Adachi, Peter Houston and Michael Moscoso Sensei. Congratulations to everyone on their hard work and dedication! We are having scheduling conflicts with Greenhill School, unfortunately tomorrow night’s practice will be cancelled. The 1st AUSKF Adult/Mudansha Kendo Seminar is scheduled in Las Vegas on January 16-17, 2016. Current kyu kenshi as well as yudansha who started kendo as an adult are welcome to participate. We are charging a participant fee of $50 per person, which will include lunch for both days of the Seminar. It is with great excitement that the AUSKF Education Committee announce the 1st AUSKF Adult / Mudansha Kendo Seminar. This Seminar will provide tailored instruction and guidance to AUSKF kenshi that first started kendo as an adult (18+ years). Instructors will be top-level AUSKF senseis from all over the U.S. Participants will be divided into similar age/rank groups so that instructors can provide personalized instruction and also act as a mentor to adult kenshi. Group activities will also be organized to encourage interaction and friendship among fellow adult kenshi. Currently half of those who already registered are yudansha. The registration deadline is 12/25/2015. Group rate of $149 per night + tax (total = $166.88 per night and total of $333.76 for two nights) for the nights of January 15th and 16th. Please call the hotel directly at 702-369-3366 or 888-492-8847 and use the Group Code G-KEMA to receive the group rate. Iroha, a local Japanese community newspaper was kind enough to feature our enbu at the yearly Akimatsuri on their front page. The monthly newspaper is freely available at local Asian supermarkets, restaurants etc. 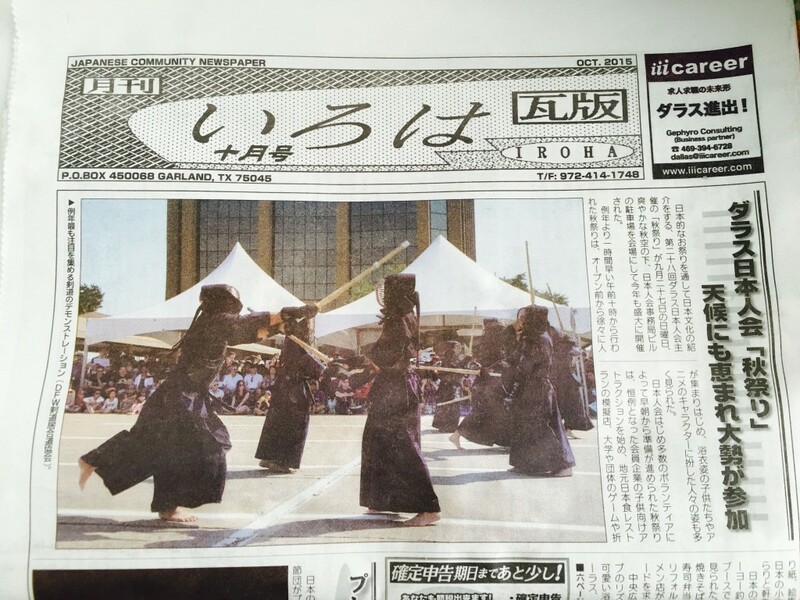 The caption besides the photo says “the yearly most eye-catching kendo demonstration by DFWKIK”. Good job everyone! Houston Kendo Kyokai will be hosting the 2015 All Ladies’ Kendo Practice. The event will be held 9am-1pm, Saturday, November 21, 2015. This event is open to full bogu wearing female kenshi that are members of Southwest U.S. Kendo & Iaido Federation (SWKIF), and ladies who are currently regularly practicing at a SWKIF affiliated dojo. This practice will be conducted by two instructors from HKK: Makiko Adachi (安達麻紀子) sensei (5 dan) and Hiroaki Kimura (木村洋明）sensei (4 dan). 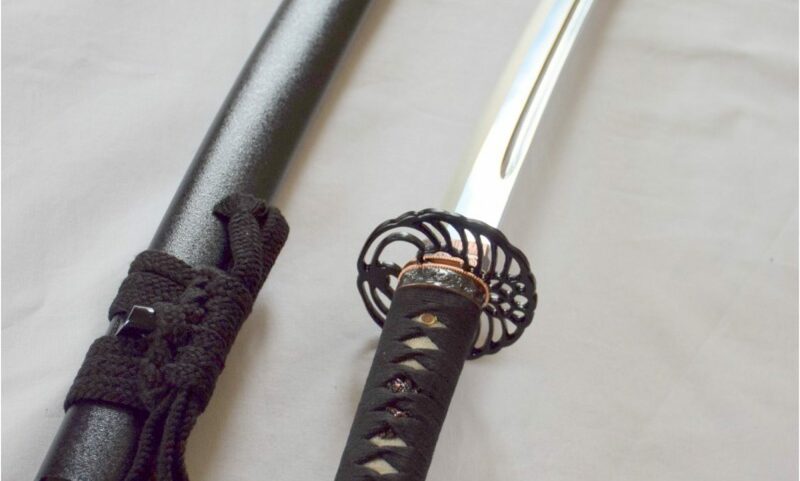 Practice will focus on improving kendo skills particularly relevant to female kenshi, with open keiko at the end of practice. Practice is going to be held at the Houston Chinese Community Center, located at 9800 Town Park Dr. Houston, TX 77036. Please complete the registration and waiver forms and email them back before Friday, November 10. Southern California Kendo Federation (SCKF) is hosting an iaido seminar and shinsa featuring guest instructor Shozo Kato Sensei, the current AUSKF Iaido chairman. He carries the Kyoshi 8 dan in kendo and Kyoshi 7 dan in Iaido. The seminar will be held at the OCB Kendo Dojo in Anaheim, CA on Saturday November 21, 2015 and Sunday November 22, 2015. An Iaido shinsa will be held on Sunday November 22, 2015, open to all AUSKF members eligible to test for ranks 1 Dan and below. All applications and fees must be received by Friday November 13, 2015. Noemí Arnal and Sangki Lee from Dallas B team were the only two who won the Longhorn Award this year! Our dojo sent 5 teams this year: Dallas A, Dallas B, UTD A, UTD B, and UTA team. Good job everyone!! There was some confusion as far as where tonight’s practice would be. Same time with our regular Iaido and Kendo practice at Greenhill School.